AKG K72 review | What Hi-Fi? Step away from the style and wireless headphones you’ll see advertised on TV and you can find a bargain. Pairs such as the AKG K72 and K52 get you studio-style headphones for under £50. Most fashion headphones at the price don’t sound great. These get you on your way to high-end sound. 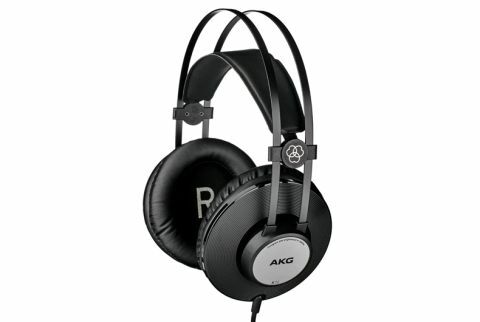 The AKG K72 are large circumaural headphones with pads large enough to engulf all but the most gigantic of ears. They help to make comfort among the best you’ll find at the price. Their headband deserves some credit too. Rather than a static padded band, a hammock of fabric cradles your head, the actual frame of the AKG K72 comprising two slim steel bands that sit above. This is a classic studio headphone design. While you could just about get away with wearing these out on the street, they’re not really designed for it. The cable provides further proof. It’s 3 metres long and thicker than that of a portable pair: great for a home studio or for attaching to a hi-fi amp, but not perfect for walking about as you’ll end up with a pocketful of wire. There’s no remote on the cable either, which is standard practice for a ‘monitor’ headphone like this. Isolation is limited too, even though the AKG K72s are closed-back. Comfort is the main aim. You could wear these all day without discomfort, and we have. One feature common to higher-end studio-style headphones that’s missing here is a removable cable. If you want a pair to last five years or more of heavy use, consider spending a bit more. The AKG K72’s construction is perfectly decent, though. Apart from the metal frame bands these headphones are all-plastic, but they feel a lot less cheap and creaky than the Sennheiser HD201s. They’re more comfortable too and their synthetic leather pads are of much higher quality, getting as close to the real stuff in appearance and feel as you’ll find anywhere near the price. Neat touches, such as the concentric circles texture on the cups, also mean you could easily convince a friend the AKG K72s cost £100 or more. These little flourishes are missing from the cheaper K52s, which usually cost around £10 less. The AKG K72s look and feel great given how cheap they are, but the real draw here is the sound. It’s expansive, with width and scale just not heard in the kind of headphones found on the high street at £40. There’s enough bass to make them a fun listen if you’re after a late-night music/movies pair rather than a monitor headphone, but the sound is relatively taut. They’re an altogether more grown-up and detailed pair of headphones than the likes of the Skullcandy Hesh. By aiming for the more neutral presentation of a pro headphone, AKG has managed to deliver many of the basic ingredients of £100-plus headphones at a much lower price here. They’re smoother-sounding than the Sennheiser HD201s and aren’t held back by poorly controlled bass, letting them handle complicated rhythms without sounding stodgy and slow. You’ll be hard-pressed to find better at the price, though there are areas that in absolute terms could be improved. The K72s’ midrange is a little coloured and boxy-sounding, making vocals and other mid-led instruments appear constrained and less coherent than the rest of the sound. It seems the aim may be to bring the midrange forward in the mix, but because it’s not entirely natural-sounding this weakness ends up being emphasised. The real question is how the K72s compare to their brothers, the K52s and K92s, which sell at a confusingly similar price. Tonally they are similar, although the claimed bass extension of the K52s is worse and the claimed treble extension of the K92s better. That said, we heard less of the midrange issue in the cheaper K52s and a little less insight too. The K92s add an extra dose of finesse to the proceedings, justifying their price premium. There are also aesthetic differences. The K52s are simpler, plainer, while the only slightly more expensive K92s switch the silver parts for gold-coloured ones, including a golden headband. The AKG K72s are great-value headphones, and better for home duties than street ’phones for a number of reasons. They’re extremely comfortable, have wider and more detailed sound than comparable street pairs and use a longer, tougher cable too. Overall, they’re a great buy.